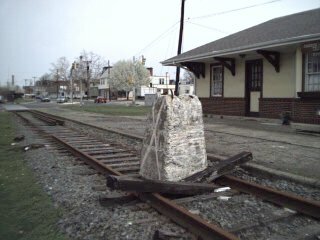 Due to track construction, this temporary buffer marks the end of the line. 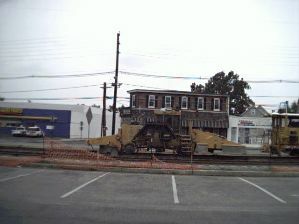 The grade crossing is under construction as well as the Rancocas Creek Bridge. 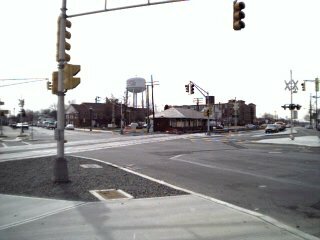 This photo, taken April 15, 2001, also shows the grade crossing at Pavilion Avenue. The new SJLRT station will be just north of the grade crossing. 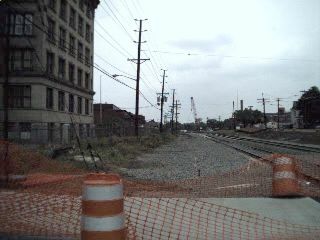 The platform of the old Camden and Amboy (later PRR) with the site of the new SJLRT station in the background. The old station, while intact, is owned by Zurbrugg Hospital and is used to house a Thrift Shop. 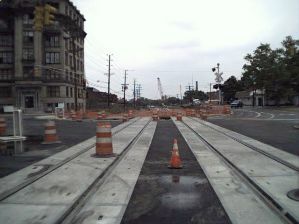 Upgraded crossing at Pavilion Avenue. 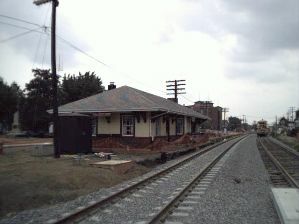 The new station will be at the left of the track. 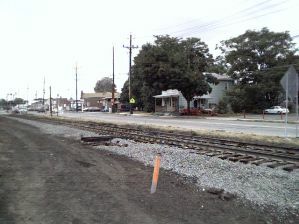 The old PRR platform now removed, new track is located close to the old PRR station. 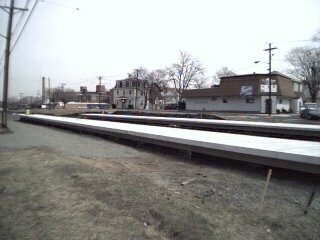 The new track is laid on concrete ties. 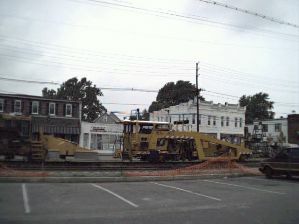 Site of new station in Riverside. New Switch. This switch will be pneumatically operated, but now must be manually thrown. 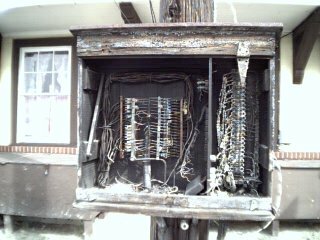 Old Signal wire. 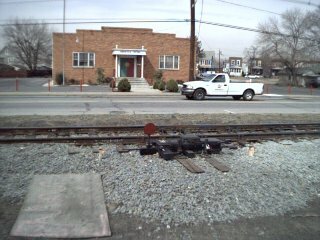 This box is adjacent to the old Riverside Station. 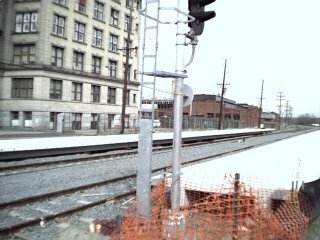 New Platforms in Riverside. One for northbound and one for southbound. 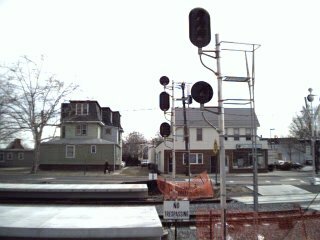 New train signal lights. These are not yet in use and are turned away from the track sight lines. From the new to the old. View from the new platforms to the old station. 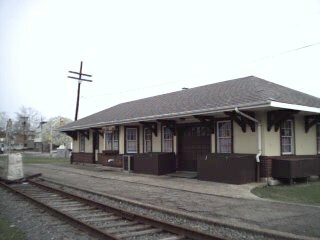 View from the north platform. 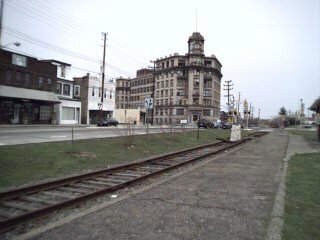 The watchcase factory is in the background. 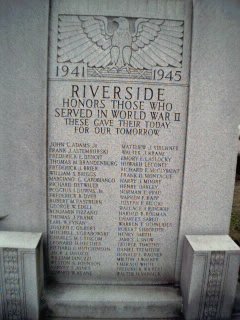 World War II memorial in Riverside. 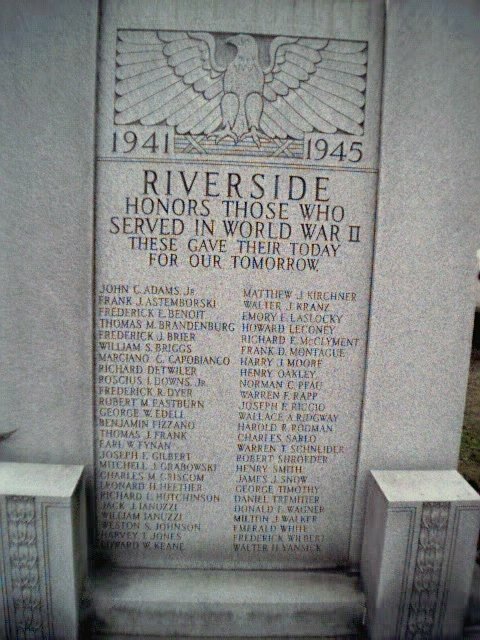 My uncle is listed among those who gave their lives for our freedom.